For the release of Game of Thrones Season 4 on Blu-ray and DVD this week, I was invited to go on a special Game of Thrones workshop day and learn traditional sword- and weapon-making! 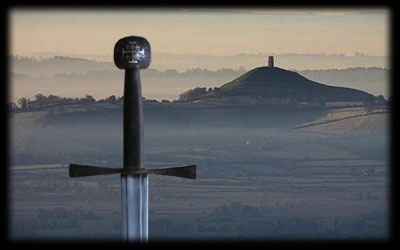 I arrived at the Forge of Avalon (under the shadow of Glastonbury Tor as master swordsmith Richard proudly proclaims), with what I hoped would be realistic expectations! Would I actually manage to create a Game of Thrones style sword during a one day workshop? Of course not. But I did get to experience all the same principles and techniques behind the ancient art and craftsmanship of being a blacksmith. My initial concerns over the heat of the fire, and using the dangerous tools and equipment, soon subsided as the desire to produce the perfect nail or poker through the art of blacksmithing took over! It certainly isn’t as easy as they make it look in Game of Thrones… that’s for sure. Watch my video for a glimpse inside the Forge of Avalon! Game of Thrones The Complete Fourth Season 4 is available now on Blu-ray & DVD. And Game of Thrones Season 5 will be premiering on Sky Atlantic on 13 April.